The Entrance Building was torn down several years ago and is in the process of being rebuilt. Note the bell on the old post that had to be rung for the caretaker. 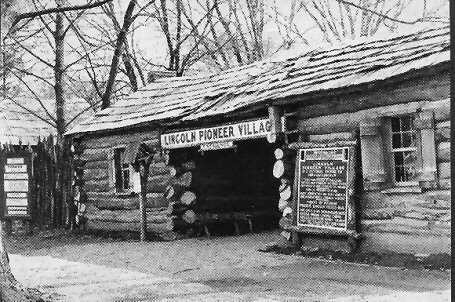 The sign at the right reads Lincoln Pioneer Village is a national shrine to Abraham Lincoln. Visiting inside of Village you see how pioneers actually lived 1816 to 1830 in Spencer County, Indiana. Our 13 village cabins have information on each cabin and Abe associated Lincoln history. Points of Interest - Museum Lincoln relics - rail Abe split. Replica Indiana Lincoln Cabin. Replica Old Pigeon Baptist Church. Visit the Village - Tell your friends.